Successfully Added 3.5 inch HDD NAS with Print Server and Bit Torrent to your Shopping Cart. When only the best will do you'll want to get your hands on one of these Network Attached Storage (NAS) enclosures from Chinavasion. This feature packed unit can be used as a simple USB 2.0 external drive or a fully operational network storage drive with printer serving (you can attach a printer to the enclosure to share across all computers on your network). 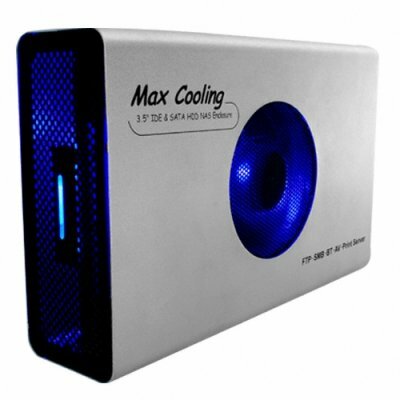 The aluminum case features active cooling (from a quiet, blue LED lit 80mm fan) and support for both SATA and IDE hard disk drives (HDD). With a built in Bit Torrent client the enclosure is able to download torrents by itself after you load the unit with a list of torrents you want you can turn off your PC. The unit is compatible with all major networking protocols and so can be used across the internet also if you want completely remote storage, perfect for those important backups. A fantastic product at a ridiculous wholesale price, order now with the confidence of a 12 month warranty from Chinvasion. -LAN access: Windows 98SE/ME/NT4.0/2000/XP/2003/Vista (32 bit version only) , Mac OS X (10.3 or above versions) , Linux and Unix (SMB/FTP). -USB access: Windows ME/2000/XP/2003/Vista (32 bit version only) , Mac OS 8.6/9.x/10.x and Linux kernel after 2.4.1.0. Good to see they mention Linux compatability. This Network Storage device is really good. Torrent Client, SMB- , FTP- , AV-, Printserver - everything works fine. Great product but the installation software (net tool 1.0)dit not find the NAS in the net work. The default IP 192.168.16.1 was not foud by this program.Manual change of the IP and the NAS works perfect.